I have just been informed of the death of Dulcie Oltersdorf who went into Craig-y-nos in 1948. 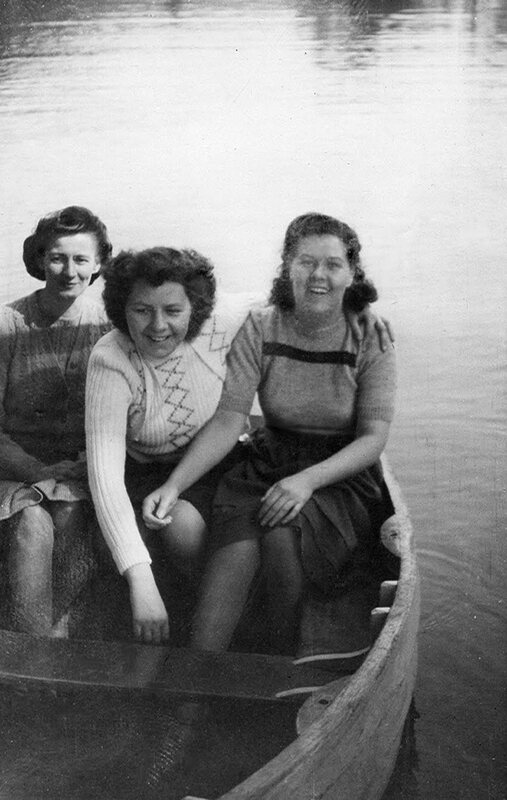 Dulcie Oltersdorf ( centre ) and friends in a rowing boat on the lake at Craig-y-nos. This was strictly against the sanatorium regime but the gardeners colluded with the young women. I was on bed rest at home for a year, waiting for a bed in Craig-y-nos. The night before going in I wanted to go to the local dance and my mother let me. She shouldn’t have, but I met my boyfriend that night, a German prisoner-of-war. He used to visit me in Craig-y-nos. I was admitted to the Annexe three days before my twenty-first birthday in 1948.
said, ‘You will have to lie on your back for another three months, maybe six months.’ I was determined that I would get better and if that was the treatment then I would do it! Sister Outram was very strict. our own good. She told my mother that a cure depended on the ability of the patient to settle down and do what they were told. always used blunt needles. Afterwards, our arms would be covered in bruises. I was happy and comfortable at Craig-y-nos. It was a good hospital. When I was discharged I married my boyfriend. We have been together now for fifty-eight years and have never had a cross word!